This beast started out as a POS Squier Bullet Mustang and ended up as an extremely versatile and fun guitar. I bought it as a gift for my younger brother since i wanted to get a cool guitar that i could mod to his specifications. It was an unacceptable guitar before the modifications , the toggle switch was cutting out and the bridge was rattling a lot. If i hadn't planned to heavily mod it then i definitely would've returned it. But, to be fair, it is a very cheap guitar, and it's pretty much what one could expect for the price. Neck was salvageable, needed fret polishing and 3 applications of fret board oil. Nut slots had to be deepened. The 12 inch radius is a good thing. And it's not a typical round D Mustang neck, instead it's almost a flat C shape, closer to what might be found on modern shredders. Not traditional, of course, but works very well and facilitates fast playing, bends, and easy chord making. The Mustang body required routing to accommodate the extra toggle and roller switches. In fact, there was barely enough body depth to allow for the roller switches, especially with the upper control plate so close to the belly/moob cutaway on the back. The body was so thin that we had to scrap the idea of using a Strat style jack. Despite the body being so thin, it still resonates well, and is very comfortable to hold with it's small shape and light weight. My brother chose to go with a Stetsbar vibrato. I think it's ugly as hell, but it's his guitar. We would've went with a different bridge/tailpiece option but, once again, the body is so thin that the choices were limited. The Stetsbar works okay, it's pitch range is less than my Strat but more than a Jazzmaster tailpiece, dipping down a little over an octave. Overall I think it's overpriced, but my brother says he doesn't regret buying it. Pick-ups are Squier Bass VI PUs that i bought on craigslist from none other than one of the Mikes from Mike and Mike's Guitar Bar ( the red headed Mike with a JM tattoo on his arm). 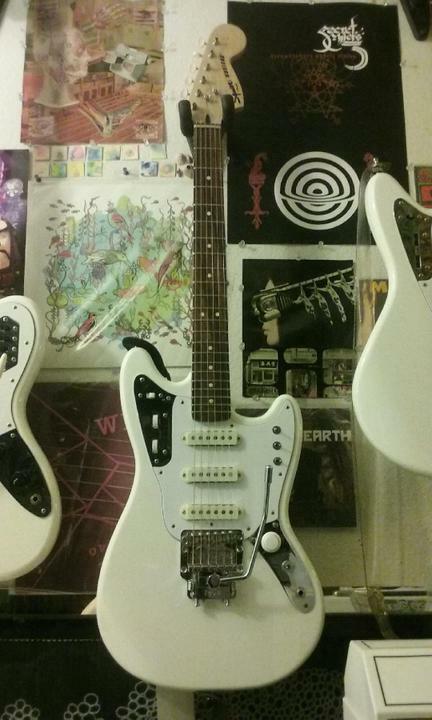 At first i had no idea who i was talking to, then i got to describing my project, so then he was telling me about a kinda similar white on white, 3 PU Mustang that he had worked on (https://mmguitarbar.files.wordpress.com/2013/10/img_0917-imp.jpg), i instantly recognized the instrument that he was referring to, and then realized who i was speaking with! It was cool to meet him and chat about guitars, he certainly has a passion. The pick ups sound awesome, and are totally beefy in series. Wiring is custom, loosely inspired by Brian May's "Red Special" in that it can achieve all series and out of phase PU combinations. But to make it a proper surf guitar i also included all parallel combos too, and a strangle switch. We added the Killswitch because my brother also likes to play Buckethead. The master controls are located in the upper control plate, i used two 1 meg mini pots for the rollers. I couldn't have put this thing together without the help of the geniuses over at the Guitarnutz2 forum, their generosity and knowledge of wiring is staggering. I made a pickguard template out of cardstock and then sent it over to Pickguardian .com. I thought it was a little pricey, and it took over a month to get back, but i think it looks good. I think in the future i'm going to try to make my own. I must admit though, making the template was difficult for me, and required many attempts before i got a satisfactory result, pickguards might seem easy, but can actually be quite difficult, especially if you're a perfectionist. My brother is happy with his new guitar, so, mission accomplished. It took over a year, off and on, with many set backs, and more money spent on parts/upgrades than the guitar itself, but was well worth it. I love what you did with the trem. Very cool build! The Squier Mustang is a great platform to modify and adapt. Last week we built a similar model for my son. Not quite a surf guitar, but very versatile with the coil splits. Very nice, Frank! Thanks for sharing! I really dig the pickguard and the look of those chrome PU covers. Indeed, there are many things that make these Bullets a great modding platform, i just wish they were a bit thicker so as to support a Jazzmaster style tailpiece, that was my only complaint. You and your son make very cool guitars together! Yes, it's amazing how you can get a huge variety of tones with a good wiring scheme, wiring has become my favorite part of building a guitar. 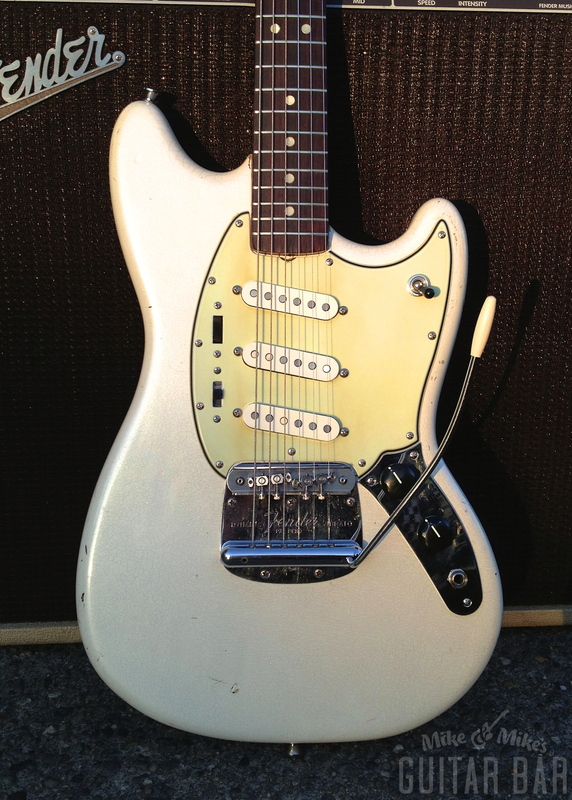 And I remember another Mustang-y guitar where you guys used those neat Marauder style pivot switches. I'm looking forward to seeing your next guitar project together! Very cool. I've never played a Squier Bullet Mustang, but I figured they would be rather crappy stock but well suited for mods. Easy to spend more on the mods than the base guitar, but then you get something really cool designed to your own specs. And I may have to keep an eye out for some of those Bass VI pickups. In fact I was surprised how good the guitar was straight out of the box. Very well dressed frets and after a quick nut job the action was spot on. I think when i make one of these tone monsters for myself i'll use a Fender Pure Vintage '65 in the bridge. I already have a set in my VM Jag and they really sound amazing. I plan to do a baritone build project some day, so I might look for the Bass VI pickups to use in that. 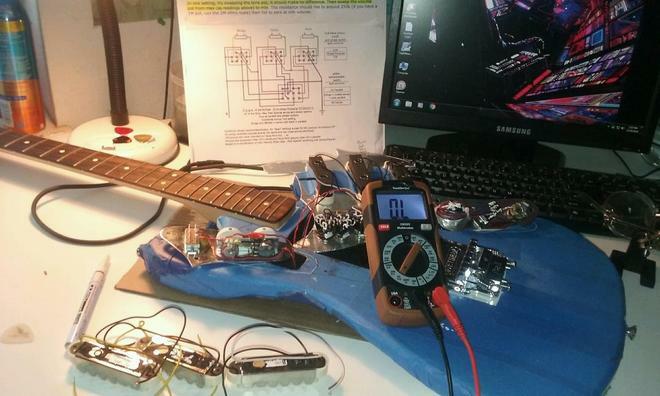 I got a Tele body for that project, but I may have to rethink things if I go for those pickups. Cool! I'll keep my eyes peeled and let you know when i see some floating around. Btw, my little bro has one of his Squire Bass VIs set up to be a baritone and it sounds really good, as one could imagine those PU are very good for deep yet sparkly tones. Scale length of course is 30 inches, it's tuned B to B, with 13 17 22p 31 41 55.